The Milledgeville property is now mostly empty and falling into decay. 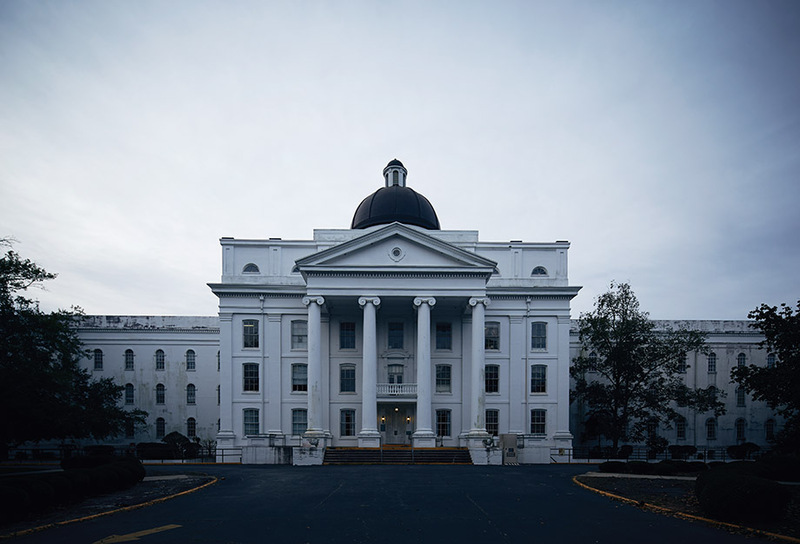 2,000-acres still echo with the memory of the patients who were treated—and mistreated—at Georgia’s state asylum. Parts of the majestic Powell Building stood when General Sherman’s troops camped on the grounds en route from Atlanta to the sea. Once the center housed administrators, with patients in two giant wings. Today only a fraction of the building is in use, accommodating state staff and employees of a redevelopment authority. Five years later, the facility opened as the Georgia Lunatic Asylum on the outskirts of the cotton-rich town that served as the antebellum state capital. The first patient, Tillman B. of Bibb County, arrived in December 1842. He died of “maniacal exhaustion” before the next summer. A long hallway in the 181,582-square-foot Powell Building provides a reminder of the vast number of patients once housed at Central State—up to 13,000 during its peak.Many more patients followed Mr. B., and the institution grew into the largest insane asylum in the world. 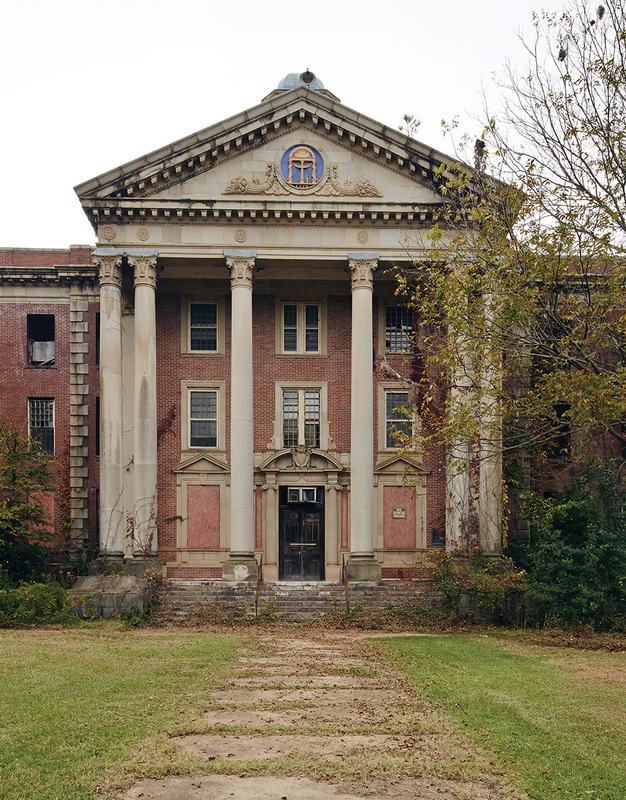 A century after it opened, 200 buildings sprawled over 2,000 acres and housed up to 13,000 patients at what was then called Central State Hospital. But throughout Georgia, it was known solely by the name of the neighboring town: Milledgeville. Thousands of Georgians were shipped to Milledgeville, often with unspecified conditions, or disabilities that did not warrant a classification of mental illness, with little more of a label than “funny.” The hospital outgrew its resources; by the 1950s, the staff-to-patient ratio was a miserable one to 100. Doctors wielded the psychiatric tools of the times—lobotomies, insulin shock, and early electroshock therapy—along with far less sophisticated techniques: Children were confined to metal cages; adults were forced to take steam baths and cold showers, confined in straitjackets, and treated with douches or “nauseants.” “It has witnessed the heights of man’s humanity and the depths of his degradation,” Dr. Peter G. Cranford, the chief clinical psychologist at the hospital in 1952, wrote in his book, But for the Grace of God: The Inside Story of the World’s Largest Insane Asylum. In 1959, the Atlanta Constitution’s Jack Nelson investigated reports of a “snake pit.” Nelson found that the thousands of patients were served by only 48 doctors, none a psychiatrist. Indeed, some of the “doctors” had been hired off the mental wards. Yes, the patients were helping to run the asylum. The series rocked the state. Asylum staff were fired, and Nelson won a Pulitzer. The state, which had ignored decades of pleas from hospital superintendents, began to provide additional funding. 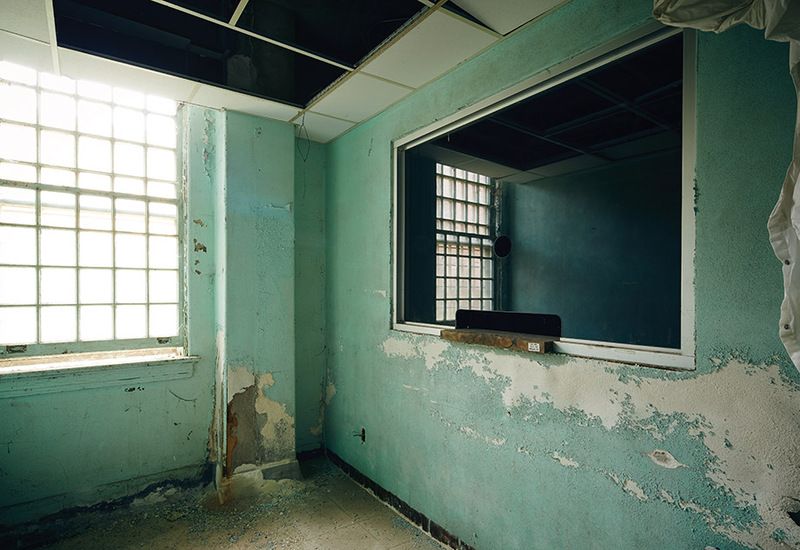 By the mid-1960s, as new psychiatric drugs allowed patients to move to less restrictive settings, Central State’s population began its steady decline. A decade before the national movement toward deinstitutionalization, Georgia governors Carl Sanders and Jimmy Carter began emptying Central State in earnest, sending mental patients to regional hospitals and community clinics, and people with developmental disabilities to small group homes. 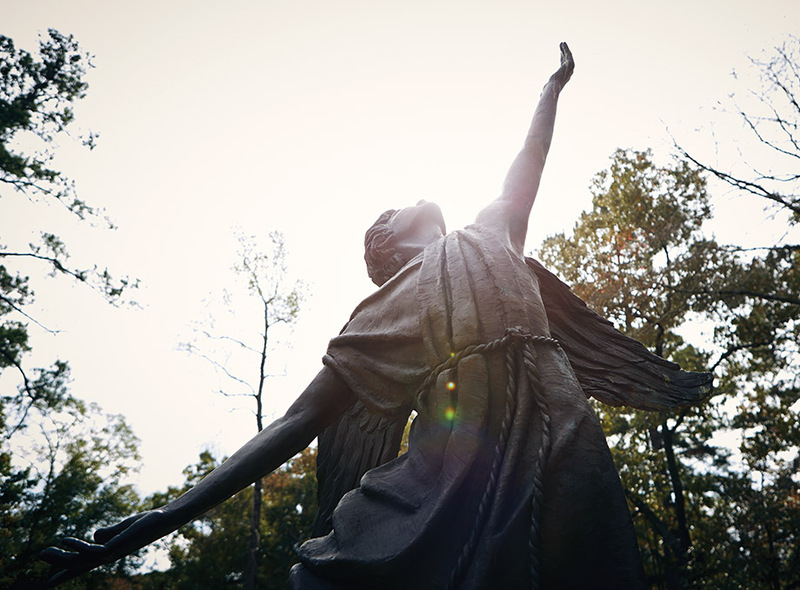 A bronze angel serves as perpetual guardian of the dead at Central State. It was erected by members of the Georgia Consumer Council, some of them former patients, after they worked with volunteers to restore the overgrown cemetery beginning in 1997. A time capsule and a CD recording the names of the dead are buried beneath the angel. This approach has been riddled with its own tragedies, such as homelessness and drug abuse. 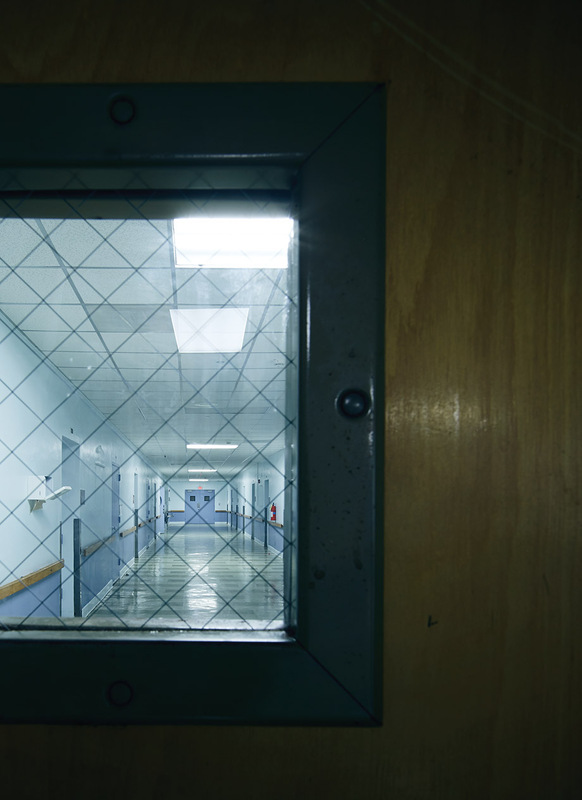 In recent years, the AJC has reported unexpected or suspicious deaths in both the community and regional psychiatric hospitals. Nonetheless, advocates do not support a return to institutions. A 1999 U.S. Supreme Court ruling in a Georgia case allows patients with mental health problems to choose community care over institutionalization if a professional agrees, and following a 2010 agreement with the federal government, Georgia will move all mentally and developmentally disabled patients to community facilities. Central State stopped accepting new patients in 2010. As the asylum’s buildings were vacated, four were converted into prisons. One prison remains on the property today. 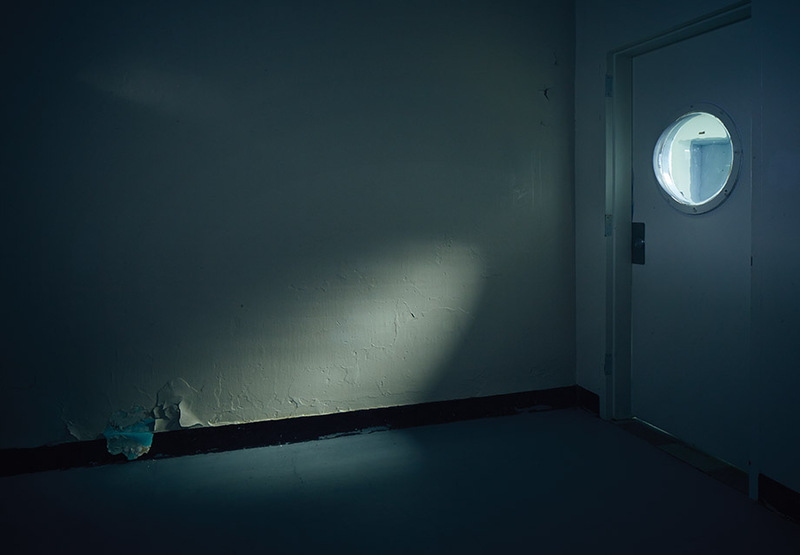 In a separate facility, the Cook Building, the hospital houses 179 forensic patients (who have been found by courts to be not guilty by reason of insanity or incompetent to stand trial). Today only 14 non-forensic patients remain at Central State, all elderly people awaiting alternative placements. By the end of this year, the state Department of Behavioral Health and Disabilities, which operated at Central State, will occupy only nine buildings. Georgia’s state seal is on the facade of the vast and imposing Jones Building, built in 1929 on the “quad” surrounding a pecan grove. It has been left to rot since 1979. The 142,140-square-foot building once served as a general-purpose hospital. The interior provided locations for the TV show The Originals, a Vampire Diaries spin-off. With fewer than 200 patients on the campus, and only a handful of administrative offices operating, Central State feels abandoned. Indeed, several of the starkly beautiful brick buildings on the “quad” surrounding a lush pecan grove have been boarded up since the late 1970s and have begun to decay into haunted ruins. Yet amid the entropy, life goes on. Church services are still held in the chapel on the quad, which hosts weddings and funerals. A new organization is trying to preserve the campus. The Central State Hospital Local Redevelopment Authority was created in 2012 by the state to revitalize and repurpose the property. Led by Milledgeville native Mike Couch, the authority has worked with real estate experts to develop a plan for reusing the property for businesses, schools, and recreation. Central State’s grounds front the Oconee River and contain winding paths that the consultants envision as ideal for bicycle trails or a concert venue. The first new contract is decidedly more practical: A geriatric care facility for parolees will move into a former prison building. Mab Segrest, a visiting scholar at nearby Georgia College, is writing a book about Central State and teaching a course titled Milledgeville and the Mind. 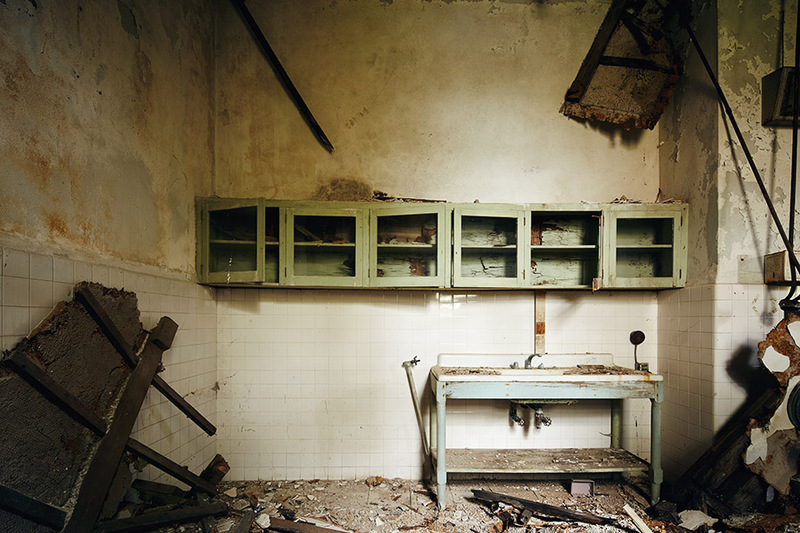 She has explored the hospital’s impact on the fiction of author Flannery O’Connor, who lived just seven miles from the asylum. “Her crazy preachers walk right out of case histories of ‘religious excitement’—their fears of ‘wise blood’ part of the belief in insanity as a hereditary illness that worsened over generations,” Segrest says. 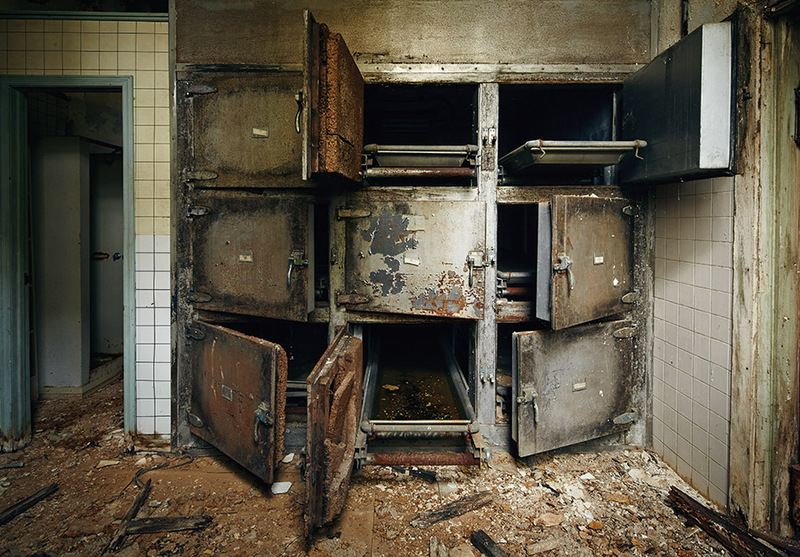 Morgue drawers sealed with iron doors once held the corpses of patients in the basement of the Jones Building. Today the building is collapsing from the top down, and falling debris covers the morgue floor. 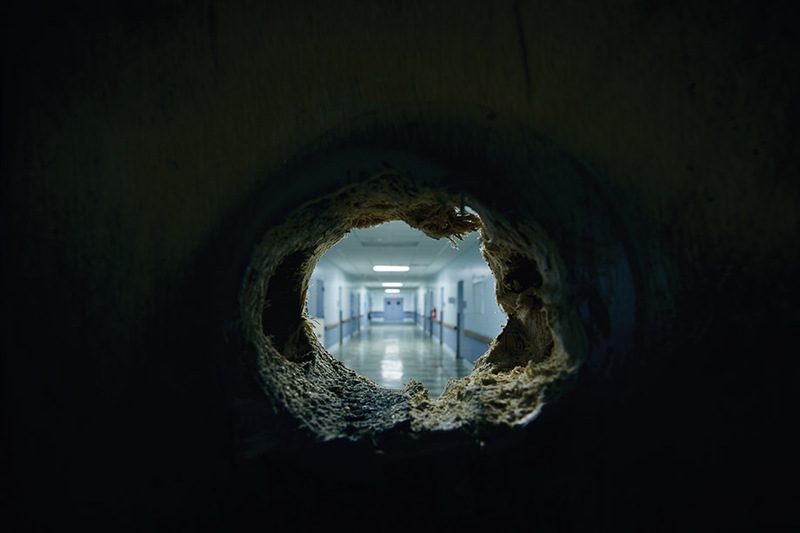 Throughout the campus, details serve as a reminder of Central State’s past, such as the rounded portal in this door, which allowed staff to observe patients—even if they hid in corners. 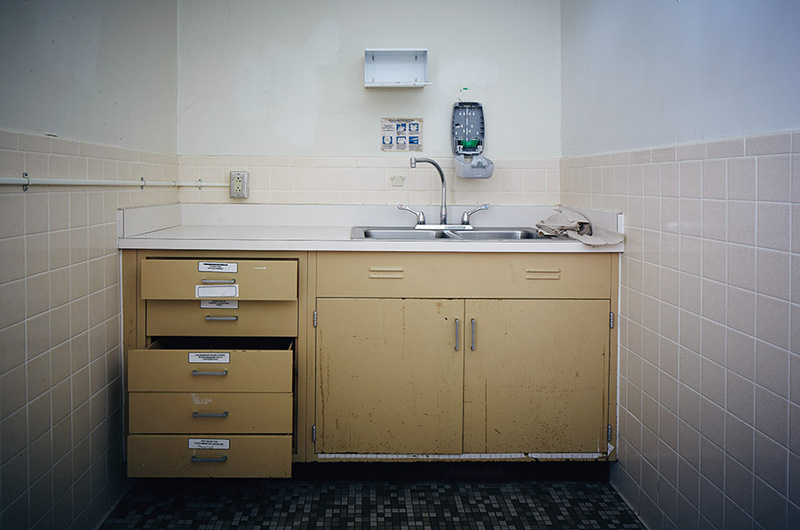 Most of the Powell Building is now empty, including treatment rooms and rooms that once housed patients. The Jones Building served as a general hospital, offering medical care to patients at Central State as well as residents of Milledgeville and the surrounding area. 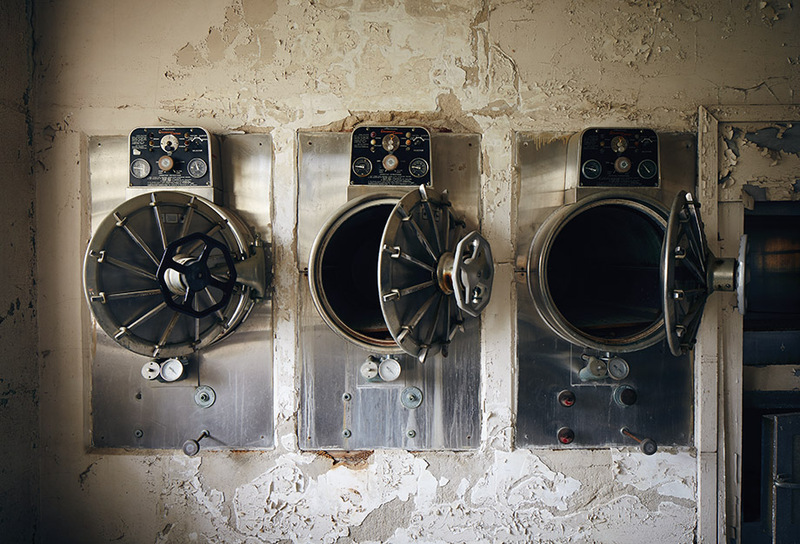 Wheeled doors that look as if they belong on a submarine were part of the machinery used to steam and sterilize equipment and garments. 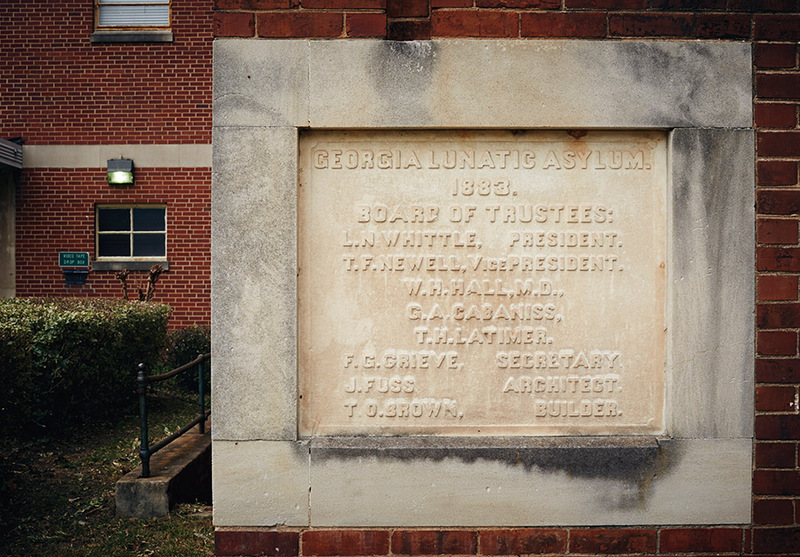 A marble marker commemorates the asylum’s origins. Advocates for redevelopment hope to preserve the Jones Building. Campus caretakers sometimes find dead foxes and hawks in the abandoned buildings. Birds fly in and out of open windows. 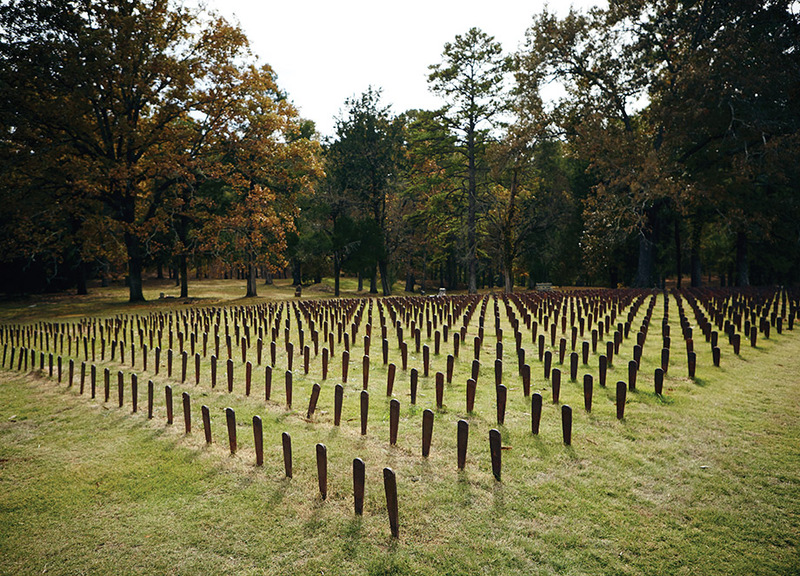 Some 2,000 cast-iron markers at Cedar Lane Cemetery commemorate the 25,000 patients buried on the hospital grounds. The markers, with numbers instead of names, once identified individual graves but were pulled up and tossed into the woods by unknowing prison inmates working as groundskeepers to make mowing easier. This article originally appeared in our February 2015 issue. Corrupt Cops! Voter Fraud! Hookers at Fort Stewart!